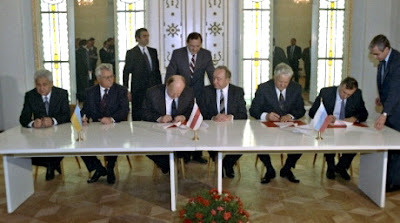 MOSCOW, Russia -- Twenty years ago today, the leaders of three Soviet republics - Russia, Ukraine and Belarus - signed an agreement which consigned the Soviet Union to history and marked the birth of new nations. Russia's president Boris Yeltsin (sitting, second Right) agreed with his Belarus counterpart Stanislav Shushkevich (sitting, third Left) and Ukrainian president Leonid Kravchuk (sitting, second Left) to replace the USSR with a commonwealth that would not be a state on December 8, 1991 in Belarus. ­RT has met with some of the participants at the crucial gathering to find out how the State, which badly needed reforms to avert collapse, ended up as an entirely new entity. "On December 8, 1991, we wrote and signed a two-page agreement on the creation of the Commonwealth of Independent States, and managed to provide for a peaceful dissolution of the Soviet empire,” recalls Gennady Burbulis, First Deputy Prime Minister of the Russian Federation, 1991-1992. Gennady Burbulis was one of just six men who sealed the fate of the Soviet Union in less than 24 hours. It had been a tough year in Soviet politics. The president of the USSR, Mikhail Gorbachev, barely survived an attempted coup d’état; the president of the Russian Federation, Boris Yeltsin, was openly contesting Gorbachev’s power. Meanwhile, the country was effectively bankrupt, with shops empty amid rising discontent. “At that time, the Soviet Union basically did not exist anymore. Not a single power or management institution of the government was functioning,” Burbulis remembers. The leaders of the USSR's founding countries – Ukraine, Belarus and Russia – decided to meet to resolve the crisis. They chose Belovezhskaya Pushcha, a forest reserve on the border between Poland and Belarus, where a hunting lodge was built years earlier for former Soviet leader Nikita Khrushchev. Although there was some discussion as to how the USSR's problems could be solved, it quickly became clear that the Soviet Union itself was part of the problem. Ukrainian President Leonid Kravchuk made it clear his country wanted out – a position backed by a referendum there in which the public voted overwhelmingly to leave. “People in other republics viewed the Soviet Union as a barrier to economic activity,” recalls Vladimir Isakov, Supreme Soviet member, 1990-1993. Though the gathering in Belovezhskaya Pushcha was aimed at somehow changing the situation in the Soviet Union, no-one there was really prepared for the creation of an entirely new political entity. “The director of the reserve was given an order, and he brought his secretary along with a typewriter,” recalls Stepan Martysyuk, gamekeeper at Belovezhskaya Pushcha. “It took her a long time to type the text. She just typed with one finger on each hand. She said she understood what was happening, but I don't think she did, really. Only later did the realization come to her, and she figured she would have to keep her mouth shut,” explains journalist Vadim Bitsan. The legitimacy of the agreement on the creation of the Commonwealth of Independent States is still questioned to this day. And many still wonder whether life has changed for the better. “The expectations were that once the USSR fell apart, an upsurge would begin. Grass would turn green in winter, everything would fall into place miraculously. But none of that happened,” explains Vladimir Isakov, Supreme Soviet member, 1990-1993. Thirteen out of the 15 Soviet republics signed the Belovezha accords. It effectively brought about the end of the USSR … but not the end of the debate … which 20 years on, continues to focus on the rights and wrongs of that turbulent time.